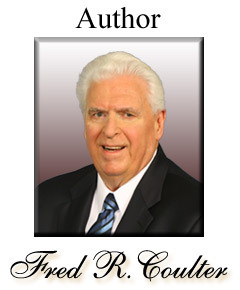 Fred R. Coulter attended the University of San Francisco and graduated from San Mateo State College before graduating from Ambassador University (Ambassador College), Pasadena, California, with a BA in Theology in 1964. He was ordained a minister of Jesus Christ in 1965 and pastored churches of God in the Pacific Northwest, the Mountain States, the greater Los Angeles area and Monterey, including the central coast area of California. Coulter completed advanced biblical and ministerial studies from 1972 to 1975 under the Ambassador University Master’s Program. While completing these studies, Coulter was encouraged by his professor of Koiné Greek to consider translating the books of the New Testament. After completing his formal instruction in Koiné Greek, Coulter continued to expand his knowledge of Greek for the next thirty years by undertaking a verse-by-verse study of the books of the New Testament using the Byzantine Text. In the course of his study, he was moved to translate the Gospel accounts into clear, easy-to-read English for contemporary readers—resulting in A Harmony of the Gospels in Modern English, now in its third edition. Ultimately, Coulter was inspired to translate the entire New Testament. After twelve years of diligent translating, The New Testament In Its Original Order—A Faithful Version with Commentary was completed and published in 2004. Coulter has dedicated his life and talents to proclaiming Jesus Christ as personal Savior for all. Since 1983, he has had an active ministry as president and pastor of the Christian Biblical Church of God, Hollister, California. The CBCG has offices in the United States, Canada, Australia, New Zealand, Africa, South Africa and the United Kingdom serving thousands of people. Each year, nearly 400,000 people from around the world actively utilize the CBCG’s Web sites—where they find timely, inspiring audio sermons and in-depth biblical study materials covering virtually every topic in Scripture. With his ministry now spanning 45 years, Fred R. Coulter has again been inspired to undertake the publication of this present work. Following the standard set by his earlier New Testament translation, The Holy Bible In Its Original Order endeavors to set forth the Scriptures, both Old and New Testaments, in plain, easy-to-read English—all in the original, inspired order. The New Testament In Its Original Order—A Faithful Version with Commentary is the only English New Testament in which the books are arranged in their correct, original order. It retains the grace and grandeur of the King James Version while clarifying many of its problematic passages. Included are commentaries that answer such questions as: What is the New Testament? Who wrote it? When was it written? Who canonized it? Other commentaries thoroughly explain the history and preservation of the Bible. Various appendices cover numerous controversial New Testament teachings in detail. It is no longer in print. The New Testament Text, Commentaries and Appendices have now been incorporated in The Holy Bible In Its Original Order. The Day Jesus the Christ Died—the Biblical Truth About His Passion, Crucifixion and Resurrection is the ONLY book to present “the rest of the story”—left out by Mel Gibson in his epic movie The Passion of the Christ. Without the true historical and biblical facts, one cannot fully understand the meaning of Jesus Christ’s horrific, humiliating and gruesome death by beating, scourging and crucifixion. The author presents the full biblical account in a most compelling way. The Seven General Epistles is designed for an in-depth verse-by-verse study of the Epistles of James; I and II Peter; I, II and III John and Jude. Lord, What Should I Do? Christians today are faced with a confusing world of compromised “Christianity”—in which false doctrinal teachings undermine the true faith of the Bible. This book clarifies the problem and shows what God requires a person to do if they are to find the true faith of Jesus Christ. Occult Holidays or God’s Holy Days—Which? For centuries the leaders of Orthodox Christendom have sold popular holidays—Halloween, Christmas, New Years, Easter, etc.—to the masses as though they had “Christian” meaning. This book effectively demonstrates that these celebrated holidays are not of God—but originated from ancient, pagan religions rooted in satanic occultism. Contrary to the false ideas of men, the true biblical holy days and feasts of God have deep spiritual meaning and outline God’s fantastic plan of salvation for all mankind—past, present and future. God’s Plan for Mankind Revealed by His Sabbath and Holy Days This first-of-its-kind, 598-page work provides a comprehensive look at God’s amazing Master Plan for the human family—precisely as it is outlined by the biblical seventh-day Sabbath and annual holy days. Each chapter is a transcript of an in-depth sermon or Bible study revealing God’s purpose from Genesis to Revelation. Actual sermons are included on an accompanying set of four CDs. On-line Studies for the serious Bible student—with written study materials and in-depth audio sermons—can be found at cbcg.org;biblicaltruthministries.org and churchathome.org.